The Wapato School Board of Directors has selected the recipients of the 2018-2019 Golden Apple Award. window (February 25-March 22) the Board received nominations for more than 40 different District employees. The Board formed a selection committee that read through all the nominations and selected five employees for recognition. 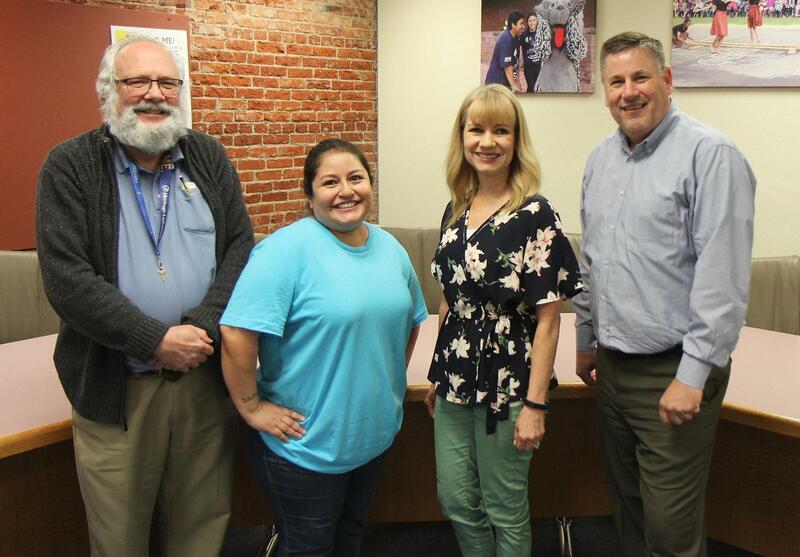 They are pictured from left to right: Wapato High School & Middle School Band Teacher Don Moore, District Print Shop Assistant Jessica Torres, Simcoe Elementary Kindergarten Teacher Linda Rucker and the District’s Community Relations/Title 1 Parent Engagement Coordinator Mike Balmelli. (not pictured is Adams Elementary Head Custodian James Bobb) Congratulations to them and to all of this year’s nominees and a big thanks to everyone who took time to submit a nomination.